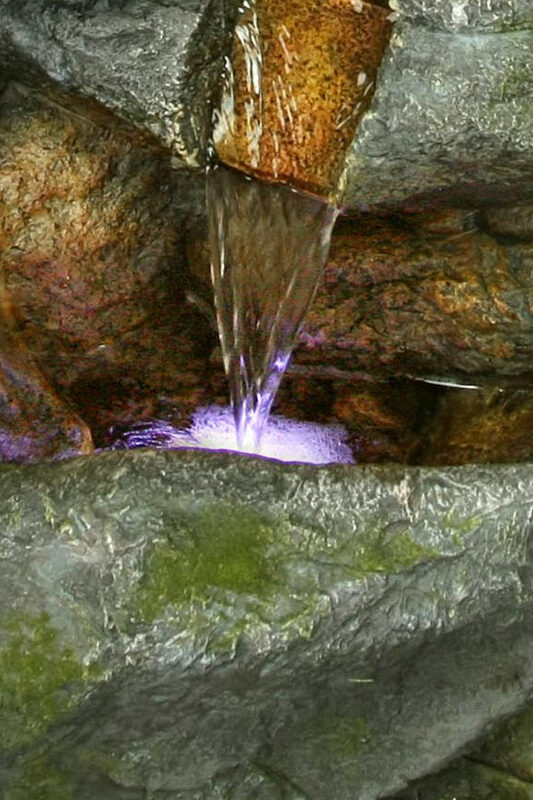 A Lighted Fountain That Looks Like A Pile Of Natural Stones. Use Indoors Or Out. Stuff Points: Earn 237 points when you buy this stuff. Strong streams of water will soothe and relax as they flow in and out of this natural looking rock formation. Although it looks like real stones stacked on top of each other, this fountain is actually molded from a fiberglass resin. This durable material allows it to look like real rocks without being super heavy, or costing you a bunch of money. It will still be durable and long lasting, but it will also be easy to install, simple to re-position, and ideal for outdoor or indoor spaces. Several rounded rocks in varying shapes and sizes combine to create multiple levels and a number of small, individual pools. Each of these pools has and underwater LED light that shines brightly from beneath the water, in order to highlight textures and add to the appeal in low light conditions. It comes complete with a powerful pump that has a one year warranty, and it is so easy to set up that you will have it operational within a matter of minutes. Once running, a steady flow of running water will set the mood as it eliminate unwanted background noises. This model is tall for a table, and shorter when compared to other floor standing models. If used on an elevated surface, it will really stand out, and when used in your yard or garden it is able to integrate nicely. Set it in a flower bed to allow foliage to surround it on all sides, or position in a corner of your patio for a more conspicuous display. You only need a flat surface when looking for a place to install it, and once plugged into an electrical outlet, your set up will be nearly complete. After you fill it with water and turn it on, it will continue to pump and cycle the same water over and over again. Because it is a completely self contained unit, you can easily put it almost anywhere, and maintenance is all but non-existent. Water will pump up the interior only to spill out at the top, and begin flowing downward. Strong streams will emerge from under and around the rock formations for a natural looking waterfall. The steady streams will then flow downward to fill each of the illuminated pools before continuing on to the next one. As water fills the pool, it will be lit from underneath to make each tier really stand out. After running down to the lower level, the water will keep flowing into the larger collection pool, only to begin it's journey again as it is pumped back up to the start. The fiberglass material looks almost identical to it's natural counterpart, but it is far lighter, and easier to handle, and it comes at a much lower cost. Perfect for the patio, deck or in your garden, this fountain would enhance any backyard decor. Due to limited splashing, and a self contained design, you can also use this model inside as well. Order Yours Today! 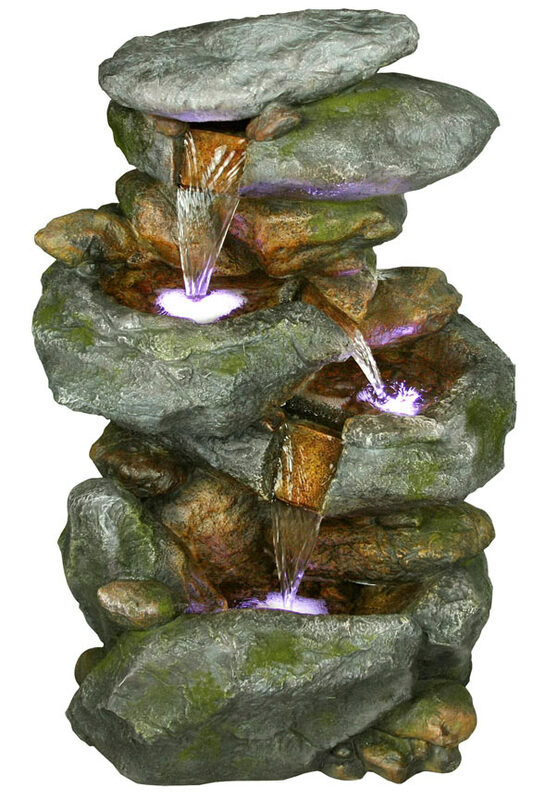 Rainforest Rocks Fountain With LED Lights - Durable fiberglass is molded to look like a pile of natural stones. Strong streams of water flow in and out to create a soothing water feature for your garden or living room. Order Yours Today! Waterfall Fountain With LED Lights. Looks Like Naturally Twisted Wood. A Long Winding Path With Multiple Waterfalls. Complete With LED lights. Simple, Modern Styling And Multiple Levels Create Relaxing Sounds And Visual Appeal. Stacked To Provide The Perfect Placement. Water Flows From One Pot To The Next.